Richmond, home of VCU, is known for its excellent pharmacy and medical programs. But the city holds another legacy in health care: as the birthplace of a product that once was famous around the world as a source of health and nutrition. That would be Valentine’s Meat Juice. Meat juice was created in 1870 when Richmond resident Anna Marie Gray Valentine fell extremely ill, possibly with a form of stomach cancer. Her husband, businessman Mann S. Valentine Jr., prepared a drink from meat and water and gave it to her. After drinking this “meat-juice,” she felt better. News spread quickly of her improvement. People wanted the juice, and the Valentine Meat Juice Company was born. Though Anna Marie Valentine died from her condition three years later, the public remained convinced the product had helped. “It didn’t save her but it was a way to get her eating and gaining nutrition,” observed MckenZie Walker, volunteer programs manager for the Valentine Museum. The nonprofit Richmond history museum was founded by the Valentine family and has an extensive collection of meat-juice artifacts. Valentine’s Meat Juice was advertised as a way to prevent nausea and promote digestion. Each 2-ounce bottle of meat juice contained the juice from 4 pounds of meat “exclusive of fat.” Patients were instructed to drink the juice “frequently and in small quantities … in preference to large draughts administered at longer periods of time.” The juice was said to be most effective when taken an hour before a meal. “It was a cure-all for everything, so whatever you were sick with you could buy meat juice for,” Walker said. Valentine’s Meat Juice was popular not only in the United States but also in Europe. Valentine received awards at the 1876 International Exposition in Philadelphia, 1878 Paris Exposition, and the 1881 International Medical and Sanitary Exposition in London for his creation. The product is similar to some being sold today as ways to improve health, Walker added. Bone broth, for example, is a popular tonic sold in health-food stores. This product was available until 1986 when the company closed its factory doors after years of declining sales. The introduction of widely available over-the-counter vitamin supplements probably played a role in that, according to the Valentine Museum’s web page on meat juice. Today there are Richmond advocates who want to bring Valentine’s Meat Juice back to market. Why not? It made a fortune once before. Maybe it can again. Valentine, M. (1873). 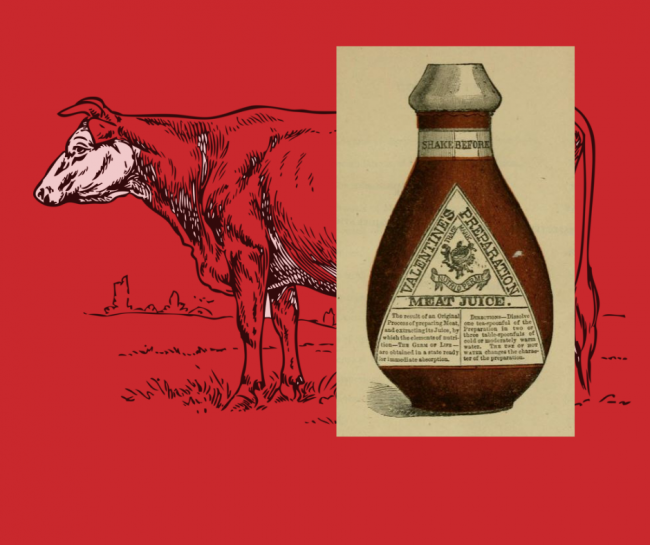 A Brief History of the Production of Valentine’s Meat Juice Together With Testimonials of the Medical Profession. Richmond, VA: B.W. Gillis Steam Pressors.